Apollo Bay is a coastal town in southwestern Victoria, Australia. On the 19th (Sun), admire the sheer force of Carisbrook Waterfall, then stop by Karmic Goat Soapworks, then take some stellar pictures from Mariners Lookout, and finally take a peaceful walk through Mait's Rest. 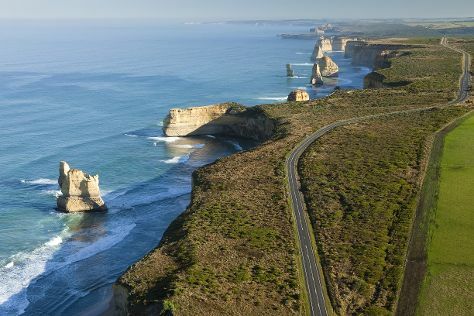 On the 20th (Mon), you'll have a packed day of sightseeing: trek along Great Ocean Walk, take a memorable drive along Great Ocean Road, and then tee off at Apollo Bay Golf Club. To find other places to visit, more things to do, maps, and tourist information, you can read our Apollo Bay trip itinerary site . Singapore, Singapore to Apollo Bay is an approximately 15-hour flight. The time zone difference moving from Singapore Time (SGT) to Australian Eastern Standard Time (Victoria) (AEST) is 2 hours. Finish your sightseeing early on the 20th (Mon) to allow enough time to travel to Portland. Portland is a city in Victoria, Australia, and is the oldest European settlement in the state. Kick off your visit on the 21st (Tue): learn about all things military at World War II Memorial Lookout, stop by Portland Strawberries, then enjoy the sea views from Cape Nelson lighthouse, and finally look for all kinds of wild species at Cape Nelson State Park. To see photos, maps, where to stay, and tourist information, go to the Portland trip planner . Drive from Apollo Bay to Portland in 4 hours. In May in Portland, expect temperatures between 19°C during the day and 9°C at night. Finish your sightseeing early on the 21st (Tue) to allow enough time to drive to Warrnambool. Warrnambool is a regional centre and former port city on the south-western coast of Victoria, Australia. Escape the urban bustle at London Bridge and Loch Ard Gorge. Get some cultural insight at Flagstaff Hill Maritime Village and Whale Bone Studio Arts. Go for a jaunt from Warrnambool to Port Campbell to see Port Campbell National Park about 1h 15 min away. There's lots more to do: contemplate the geological forces at Tower Hill Wildlife Reserve, look for all kinds of wild species at Thunder point Coastal Reserve, contemplate the waterfront views at Bay of Islands, and step off the mainland to explore Griffiths Island. For photos, ratings, other places to visit, and tourist information, you can read our Warrnambool journey planner . You can drive from Portland to Warrnambool in 1.5 hours. Wrap up your sightseeing on the 24th (Fri) to allow time to travel to Aireys Inlet. Aireys Inlet is a small coastal inlet and town located on the Great Ocean Road, southwest of Melbourne, Victoria, Australia. Your itinerary includes some good beach time at Lorne Beach and Bells Beach. 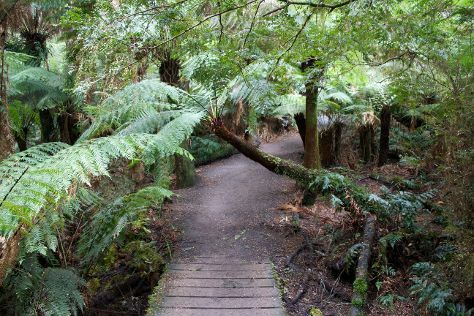 Step out of the city life by going to Erskine Falls and The Great Ocean Road. When in Aireys Inlet, make a side trip to see Spas in Torquay, approximately 40 minutes away. There's still lots to do: visit a coastal fixture at Split Point Lighthouse, stroll through Anglesea Bike Park, make a trip to Anglesea Art House, and look for gifts at Great Escape Books. To find traveler tips, where to stay, and other tourist information, read Aireys Inlet trip planner . Traveling by car from Warrnambool to Aireys Inlet takes 2.5 hours. In May, daytime highs in Aireys Inlet are 20°C, while nighttime lows are 8°C. Finish your sightseeing early on the 27th (Mon) so you can drive to Melbourne. Eschew the tourist crowds and head to Ballarat Wildlife Park and Bruno's Art and Sculpture Garden. Do your shopping at Art Gallery of Ballarat and Yarra Valley Chocolaterie & Ice Creamery. Get out of town with these interesting Melbourne side-trips: Maddens Rise (in Coldstream) and Captains Creek Organic Wines (in Blampied). There's still lots to do: browse the exhibits of Shrine of Remembrance, contemplate the long history of Old Melbourne Gaol, admire the natural beauty at Melbourne Zoo, and enjoy unforgettable views with a balloon tour. For ratings, traveler tips, and tourist information, refer to the Melbourne attractions planning site . Getting from Aireys Inlet to Melbourne by car takes about 2 hours. In May, daytime highs in Melbourne are 20°C, while nighttime lows are 9°C. Wrap up your sightseeing by early afternoon on the 2nd (Sun) to allow time for travel back home.